KENNEDY SPACE CENTER, Fla. — NASA is currently working under an initiative to better utilize the energy that helps power the location’s facilities. This includes a large thermal energy storage tank that was recently installed. In contrast to most home central air conditioning systems that use a refrigerant to cool air, large commercial buildings and office parks often use chilled water as a coolant to cool and dehumidify interior environments. Kennedy Space Center‘s cooling system includes a large central chiller building that uses electricity to chill water that is then pumped to most of the buildings in the complex. The water returns to the chiller to be again cooled, a closed-loop process that constantly operates to provide a comfortable interior work area for employees. As explained in a press briefing by KSC project manager Ismael Otero, the complex recently installed a large 2.8-million-gallon (10.6-million-liter) thermal energy storage tank outside the chiller building. This allows KSC to store water to be chilled during off-peak nighttime hours for use during the day when electricity costs are higher. The 90-foot (27-meter) high tank has concrete walls that are up to 10 inches (25 centimeters) thick and is coated with a tough external foam membrane to minimize the warming effects of the hot Florida sun. 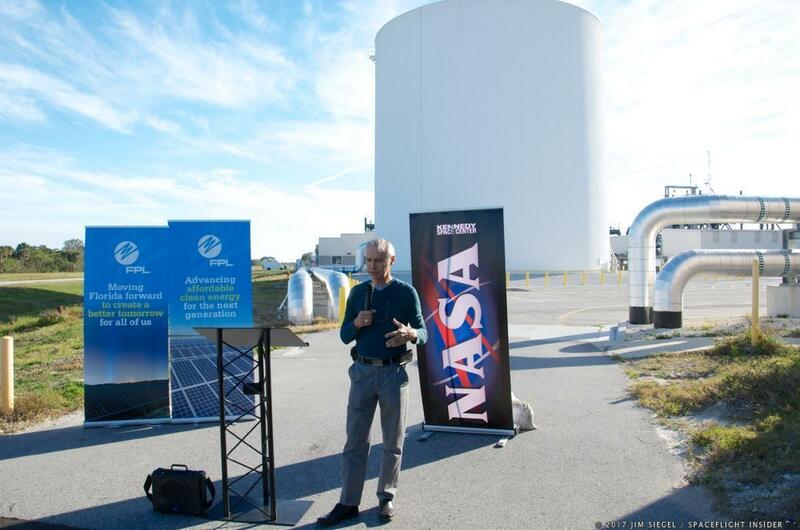 “The Thermal Energy Storage Tank Project, one of many at KSC aimed at improving energy and environmental efficiency, saves about a quarter of a million dollars annually in energy costs,” Otero said. Furthermore, the project also earned a $1.5 million rebate from Florida Power & Light. That rebate, in turn, is funding other energy saving projects funds within the KSC complex. Most notably, according to Dan Clark of the NASA Sustainability Team, is an initiative to replace over a hundred external lights with amber LED lights, which has a wavelength invisible to sea turtles. “Young sea turtles become disoriented by conventional nighttime lighting,” Clark said. The new LED lights will contribute to maintaining an eco-friendly environment for these and other creatures that share KSC with NASA.